Hi everybody - welcome to my blog! This is my very first blog post. I’ve never written a blog before, so please bear with me as I find my way. Let me introduce myself. My name is Beata and I am 40 years old. I am originally from Serbia but moved to the UK about 15 years ago and now live in Surrey with my partner John and his two children. I’m the one in the front! In July 2012, at the age of 38, I was given the devastating news that I had advanced ovarian cancer. I was told that I may only have 2 years to live and a maximum of 8 if I am very lucky. 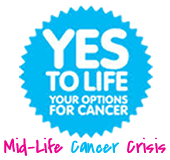 When most people have a mid-life crisis they do something like climb a mountain or maybe start up a new career, for me it’s a very different type of challenge – a mid-life cancer crisis. Throughout my life I’ve faced many difficult challenges but none bigger than this one. I have fought hard to get here today, so I’m not willing to accept that my life may be snatched away from me so soon. I am planning to be very, very lucky and live another 50 years but I know I have a very big fight on my hands. Me with no hair after chemo! I am starting this blog for anyone who is interested in following what I am doing, seeing how I am progressing and finding out what I have found useful in my battle with cancer. Since I was diagnosed in July 2012, I have tried many different approaches to fight my cancer and have learnt a great deal in the process. I want to share some of my experiences here in the hope that it will help others. There are people who say that cancer cannot be cured unless you address the cause as well as the symptoms. I firmly believe this. I am convinced my cancer started because of my unhealthy food intake, my lifestyle and the level of stress I was under; basically I was struggling to control my stress. Since then I have read masses of books and information on the internet and I have drastically changed my diet and lifestyle. I now eat healthily and lead a much healthier lifestyle. The stress part of my illness is the trickiest one. I am reading as much as I can about mindfulness, stress reduction, endless quantum possibilities, and meditation and, I must say, at times I feel my stress level is better. So, I’m sure that if I keep practicing, reading and listening to lectures as much as I can and I will get there. I will eventually become a little Buddha! But I need to gain time to achieve that and at the moment time is not on my side. That’s it for now! Join me as I journey through the biggest fight of my life and I’ll do my best to share with you what has helped me and what hasn’t.